This video will show you how to find the correct RSS feed for your player. If your show is available in iTunes, the most reliable way to find the feed is using this tool from Regan Starr. Important note: When you add a URL into the Smart Podcast Player, you need to include http://. In the box start typing the name of your podcast, as it appears in iTunes. Type slowly, and stop as soon as you see your logo. If you type in the whole name and it doesn’t show up, we've found that deleting a couple letters helps. We'll start typing in Smart Passive Income, and you’ll see what comes up here. It looks like Pat sent this podcast through Feedburner before submitting it. It’s very common that while you may be hosting your podcast files on Libsyn, as Pat does, you may have run your feed through a service like Feedburner or a plugin like PowerPress. SoundCloud users, you’re our one exception. Let’s take a quick look at the AskPat Podcast, which is hosted on SoundCloud. You’ll see that we get this long SoundCloud URL. Because you’ve set up your SoundCloud key in the previous video, you can use the URL for your account: http://soundcloud.com/yourusername. 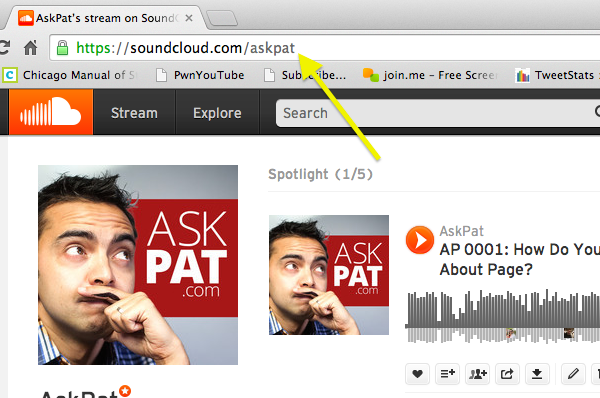 For the AskPat Podcast, the feed URL we'll use is: http://soundcloud.com/askpat.